Chris Hughton is confident striker Glenn Murray will be fit for Albion's Premier League curtain-raiser at Watford next Saturday. Frontman Murray netted 12 league goals for the Seagulls last season but was forced off after just 13 minutes, replaced by Tomer Hemed, in his side's 2-1 pre-season friendly win over Nantes at the Amex on Friday. Despite the striker facing a fight to make Brighton's Premier League opener at the Hornets, Hughton is confident his frontman will be available for selection. He said: "We’re very confident about Watford. He took a whack on his back in training yesterday and probably what’s happened is tonight’s come too soon. Murray’s injury paved the way for Israeli international Hemed to stake a claim for a starting spot at Vicarage Road. The forward did not disappoint, netting in the first half and providing an assist for Pascal Gross early in the second. 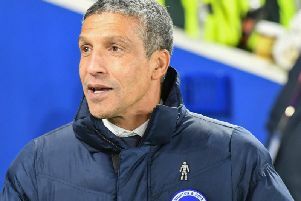 Summer signing Florin Andone and Jurgen Locadia were both missing from Brighton's squad for the final pre-season friendly with Nantes, with Hughton providing an update on his strike duo. “Jurgen (Locadia) is back in training, with Florin we’re just having to manage him a little bit. Albion supporters were given the chance to see new record signing Alireza Jahanbakhsh and midfielder Yves Bissouma feature for the first time at the Amex. The pair were given a 20 minute cameo but Hughton felt they had little time too make an impact. He said: “It was probably a difficult time to come on because I think when Alizera (Jahanbakhsh) and Yves (Bissouma) came on it was during Nantes' better spell, so certainly most of what they had to do was more defensive. I think we’ll have to wait and see a little bit more of him.